As Caramor glided through Avamoa Pass on the north-west side of Huahine, we glanced with curiosity at the thundering waves on either side. We could see the coral reef where they were breaking, sticking up out of the water. We had arrived with a plan, spend a week moored off Fare, the main village and get stuck into Pesda Press work. Early August is a critical month for any book Franco wants to publish in time for the Christmas market. As editing work is fairly brain intensive, we would take a break each day to go snorkelling, kayaking or biking. The next morning, the wave on the right hand side of the pass was enormous and surfers were riding it expertly. We paddled out and watched them for a while. Did we dare ... We were still a bit bruised (emotionally) from our failure to surf in Tahiti and had kind of given up on the idea, maybe we just weren’t good enough yet for Pacific island surfing. I dug out ‘the Stormrider Surf Guide’ to the Pacific (we couldn’t find a ‘Light-breeze-rider’s Surf Guide’) and looked up our local wave. It said things like “classic Polynesian surf” and “long powerful walls” - gobbledegook to me. It also mentioned that the local surfers were angry young men and that you had to spend nights on end drinking with them until you had proven that you “respect the wave, Man”. This sounded like absolute tosh. We have nothing to prove and besides, any sailor that has got this far has more than a healthy respect for the ocean and its waves. I was up for having a go on the wave, though. After all the worst that could happen would be a good splattering against the coral bottom, a bit of pain and a mouthful of sea water has never put me off. I was less keen on the snotty teenagers telling me I couldn’t bob around where I wanted to. The solution seemed to be to get there very early but not so early that the sharks were still peckish. Franco, with his vast experience of kayak surfing was still eyeing up the wave. He wasn’t sure. Given that he is far more sensible than me, I listened to his judgement. We decided that we needed to improve, we would go surfing in New Zealand, hopefully off a forgiving sandy beach. Instead we went snorkelling. It wasn’t as amazing as Fakarava but we still met some fun fish. The small black ones were the most curious, watching us quite brazenly before disappearing into a hole. We saw new varieties of trigger fish. Most are brightly coloured and quite shy. If they think you are staring, they vanish into their warren. The reason they are called trigger fish is because when they are in their den, their top fin, a series of hard spines, lifts up and locks, like a trigger, anchoring them against the corral ‘ceiling’. Other fish we saw were so well camouflaged that when we blinked, we could no longer make them out against the background. There were no sharks and the lagoon felt a bit empty without them. 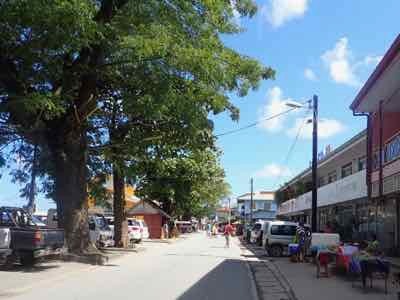 Fare is.a small lively town with a morning market on the quay and a large very well stocked supermarket. It even has a gym in an enormous hangar with every exercise machine you could think of. “Huahine, the Wild One” say the tourist brochures. A lot of twaddle has been written about French Polynesia, it is as if the opinion of the first white men that arrived several centuries ago, still stands. We wandered towards the edge of town but got no further than the food cart selling waffles, pancakes and ice-cream. The banana split was delicious. We went again a few days later but he had no bananas and the ‘chocolate liégeois’ wasn’t as good. In the kayaks we paddled up Haavai Bay to Fitii Village. It was Sunday and the singing, as we passed the church, was exquisite. The tunes were lively, joyful, melodious with multiple harmonies and accompanied by an energising drum beat. I can understand why people still go to church here. 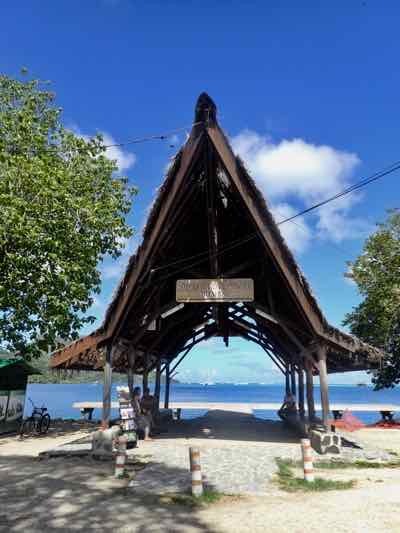 In an old guide book, there was mention of a private botanical gardens on the southern end of Huahine Nui (Big Huahine), just six kilometres from Fare. We decided to cycle there the following morning. As I started to get the bikes ready, I suddenly found Franco changing into his swim suit and blowing up his surfboard. His face was set with a determined look, he had seen that the waves were more manageable today and clearly made up his mind to go surfing. Franco went ahead while I locked up. Swimming out to the break on my board, I suddenly felt quite vulnerable. The sun was in my eyes and I couldn’t see into the water. I just hoped there were no short-sighted sharks looking for yummy turtle. I have it from an optician - sharks have poor eyesight and most attacks against surfers are because they mistake them for a turtle or a seal, whichever is their main diet. Already bobbing in the water waiting for waves, was Sebastian from yacht ‘Silver Moon”. We’d seen her previously in Fakarava. He gave us a few top tips and told us that he’d been out the day before and that the local surfers had all been very friendly. Maybe the snotty ones have grown into full-blown alcoholics or large fat blobs no longer able to stand up on a board. Another guy paddled out, his name was Jason and he was on holiday on the island. The swell was a lot smaller than on previous days, this was why none of the locals were out. Most of the waves were too small to surf but from time to time a larger set came through. As we waited we could see all the way to the bottom. There were neither fish nor sharks. When a larger wave came through, we had no problem catching it. Soon we were getting up but neither of us managed to ride for very long. There was more water over the reef than we had expected and we only ended up with mild ‘reef rash’ as we scraped along the bottom. The swim back to Caramor was exhausting and we collapsed in a pile in front of a cup of coffee, elated that we had dared have a go. The next morning there was no surf so we packed the bikes into the dinghy and paddled to Fare. When we got to the junction where the botanical gardens should have been, we found out that the venture had shut down. Instead we cycled down to the bridge that joins Huahine Nui to Huahine Iti (Little Huahine). Both islands are within the same fringing reef. Soon it appeared we were committed to peddling around Iti. The road was pleasant, with fewer cars than on Moorea and a few more hills. The distance was 30km so perfectly manageable, only, because we had expected to eat lunch at the gardens, we hadn’t brought any food. After South America where every commercial opportunity, however small, is exploited, the contrast is striking. French Polynesians can’t really be bothered to make money. We passed a couple of places selling hand painted pareu (colourful fabrics worn around the body) but nobody was selling drinks or food of any description, despite a steady trickle of tourists passing through. A sign by the side of the road was advertising a ‘marae’ (archeological piles of stones thought to be where the nobles lived) so we turned off. It was by the lagoon, large coral slabs set upright in a large rectangular and backfilled with coral rubble. Unfortunately there was no interpretation. We guessed the nobles in question had been fishermen and that once upon a time, the rubble must have had soil on top because as it is, it would be impossible to walk on without twisting your ankles. A few hundred metres down the road, we came to the first shop since the outskirts of Fare. As we parked the bikes, the door slid shut. I simultaneously glanced at the opening hours and my watch. Both said 12pm. “Quick Franco, beg!” I urged. He called through the door and very kindly, the shop assistant agreed to let him in. It would have been a real blow to miss the shop for that pile of rubble. I heard Franco discussing the absence of tomatoes and eventually he emerged triumphant, brandishing a couple of chowmein filled baguettes. It was the first time we’d come across the well known Polynesian staple as a sandwich filling. Satiated, we carried on. 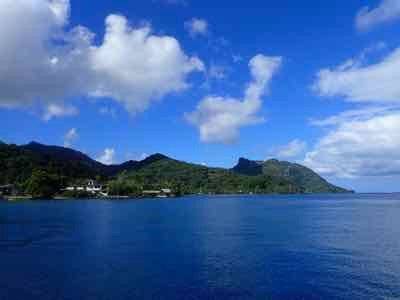 Huahine is a beautiful island, a lush mountainous heartland surrounded by a turquoise blue lagoon. The southern end had a couple of low key resorts and quite a number of yachts anchored off. As we peddled up the hill leading to the bridge, we came to a stall by the side of the road selling piles of bananas. An entrepreneur at last! Her name was Juliana and she was delighted we were going to buy her bananas. A pile of perfectly ripe ones was 500 francs, of over-ripe verging on black was 500 and a pile of green was 300. She would have liked us to buy the black bananas, but hey when it’s past its ‘sell by date’ you need to reduce the price! She dashed across the road and gave me a hug. “Nobody has ever told me that,” she said. “I love you, darling.” She added. “What are we going to do with all these bananas?” Franco asked. “We’re going to stop at the ice-cream cart, he won’t have any bananas but we will.” I explained. Franco glanced at me admiringly, either because of my cunning or, more likely because of my greed, that maybe just then had surpassed his own. Back in town, we stopped at the cart, as expected he had no bananas. Every morning, there are a dozen stalls in the same road selling bananas. Neither did he have any vanilla ice-cream. The fact that it was our third visit and that we had brought our own bananas turned our usually taciturn seller into a chatterbox. He told us he is French but has been living in Huahine for the past 25 years. He had some strange ideas and when he started telling us that inbreeding is not a problem, only a religious taboo, we decided we’d preferred him uncommunicative. It was time to get ready to leave. Slowly we packed all our toys; the bicycles, the surf boards, the kayaks, the snorkelling gear and Arnie, our faithful dinghy all needed stowing below deck. 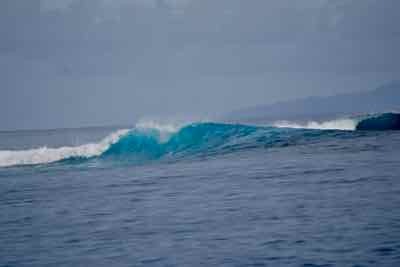 The day we set off, the surf was back and as we motored out, we admired the pros racing down our wave.